Good morning. While our weather remains exceptionally fine for this time of year, we do have some significant air quality concerns for the metro area. First, and most dramatically, is the Deer Park Fire incident at the Intercontinental Terminals Company, which continues to burn unrestrained this morning. The key thing to watch, in terms of weather, is “mixing heights,” which is the level that smoke from the fire will rise in response to the atmospheric profile. Put another way, the smoke will rise as long as it is warmer than the surrounding air. These mixing heights have lowered this morning to about 500 feet, in response to cooler nighttime temperatures, but they should steadily rise to about 5,000 feet or so today, keeping the smoke plume above the ground. A number of readers have asked how concerned we should be about this fire in terms of air quality. This is beyond my scope of expertise, but overall I would just say this incident is pretty egregious, and that we should hold our elected officials accountable for the leaders the appoint to agencies like the Texas Commission on Environmental Quality, which theoretically should be preventing accidents like these, monitoring them, and ensuring they don’t happen again. The chemical industry provides many good paying jobs for the Houston region, but that doesn’t mean we should accept accidents such as these as part of the bargain. The other concern we have this morning is our ongoing battle with spring pollen season. Tree pollen remains “extremely heavy” in the city of Houston, and grass pollen is also a problem as well. Most of the tree pollen is coming from oaks. This problem will likely persist until the region gets its next moderate to heavy rainfall, which may come around Monday—or maybe not even then. Now, onto the forecast. 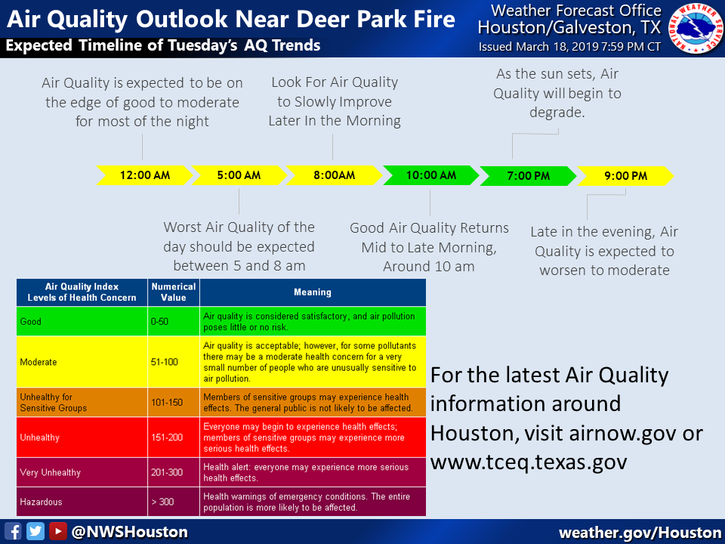 Beyond our concerns with the Deer Park fire, there is not much to say against the weather for the rest of this work week. 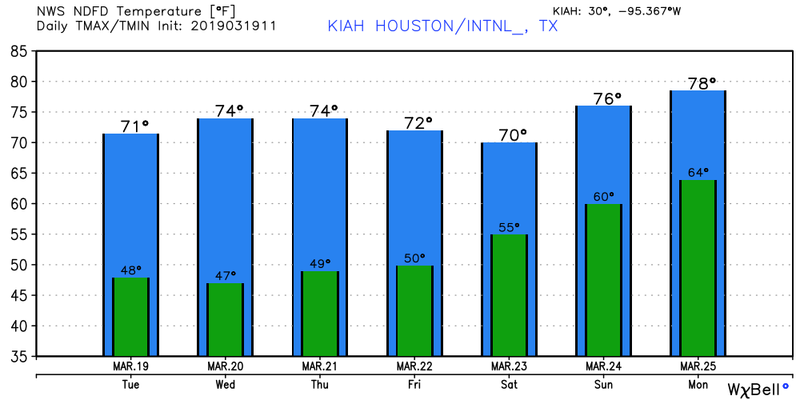 The next three days should be exceptional, with mostly sunny skies, highs in the low- to mid-70s, and overnight low temperatures falling down to around 50 degrees in the city. This is spring as spring should be. This should be another pleasant day in the 70s, but as the atmospheric flow finally swings around to the southeast, we’ll see a few more clouds, and low temperatures around 60 degrees. In response to the onshore flow, and a pair of upper-level atmospheric systems, our weather this weekend is a little more difficult to pin down. Right now I’m going with highs generally in the 70s, along with partly to mostly cloudy skies on Saturday, and perhaps a little more sunshine on Sunday. Some light rain is possible both days, but models aren’t overly bullish on accumulations, with perhaps a tenth of an inch or two. We’ll try to get a better handle on the forecast in a day or so. It appears as though rain chances will rise on Monday, or Monday night, ahead of the region’s next decently strong cold front. Hopefully we get enough rain to knock the pollen out of the air, but it’s hard to have any guarantees this far out. Quick question. Why does the cooler lower mixing height of the smoke? Is it cooling the smoke faster? Otherwise, the smoke would be much lighter than the cooler, heavier air and should rise higher. When a parcel of air rises, it cools at a certain rate. As long as a parcel of air is warmer than the surrounding air, it will rise. When that parcel of air gets to other air that is the same temperature or warmer, the parcel stops rising. The boundary layer inversion (where the air stops cooling off dramatically with height) typically lowers during the night with the elimination of diurnal heating. So you are saying as we ascend from earth, the air gets warmer, not cooler. And because at night the sun is no longer heating the air, the air gets warmer closer to the ground than during the day when the sun is warming the air. The other complexity is that a rising parcel of air may (and often does) cool more rapidly than the lapse rate of the surrounding air column. (Helpful to look up “lapse rate” here.) This leads to a heated parcel of air (hot smoke) eventually cooling down to the temperature of the air around it — thus the buoyancy of the parcel disappears and the parcel stops rising. Understanding the vertical temperature profile of the atmosphere on any given day and time is one (big) part in determining the mixing level (as well as determining when we’ll get fair-weather cumulus clouds, or when we’ll get thunderstorms). For the nerdy weather enthusiast, understanding lapse rates and skew-T/Log-P plots is extraordinarily helpful in understanding what is going on in the atmosphere. Fascinating how my comment about the clickhouston article saying that the accident was preventable–a bad manifold–and that ITC has a history of EPA violations. Fact: the EPA hasn’t gone nearly far enough, according to the Houston Chronicle, “Deerpark Fire Reignites Crisis of Confidence In TCEQ that the TCEQ effectively castrated the EPA in Texas. But, hey, Texas, it’s all good. Get out and enjoy the clean air. Go have yourself a swim in the Gulf. Everything’s fine. Should people who live in high rises be concerned about the lowering of the plume to 400/500 feet? As a person with compromised lungs and chemical sensitivity I am sort of the canary in the coal mine. Our officials may say our air quality is good based on particulates, but my lungs say the air quality based on chemicals is bad. And that was true before the visible plume was over my house (unfortunatelyit is here today). It’s a shame that such a beautiful week is getting ruined because of some greedy corporations disregard of safety to save a buck. And I don’t believe a word these officials saying everything’s just peachy, it’s happened before, no biggie. Sorry but millions of pounds of chemicals that is used to make nail polish remover and paint thinner is a bit concerning, but maybe it’s just me. I don’t know if I would be so quick to blame “greedy corporations” when most likely the blame can be traced down to someone failing to follow safe work practices or failing to properly assess the risks in performing a job. I would bet there will be some openings for plant operators, maintenance personnel, and maybe an HSE manager showing up real soon now. That’s even if that particular company even survives this incident. It might take a while, but you know after this comes the investigations, the lawsuits, and everything that comes with it. Actually, none of those tanks had a fire extinguishing system in place, which is why ITC isn’t ISO certified in that particular plant. It is pure greed to no have such systems installed, but ITC did it because the ISO certification isn’t compliance-based. So you know all the facts already that led to this incident? Well the US EPA as well. A former head of the EPA region that includes south Texas once said, (paraphrased), “I intend to crucify the petrochemical industry with regulation and lawsuits.” That was a stupid objective. He was forced to resign as a result. I worked in corporate planning in refining / petrochemicals for over 25 years. There are many “good” companies (including where I worked) that have a simple environmental / safety objective — ZERO INCIDENTS. They spend boatloads of money to achieve this goal. A huge majority of the time they succeed, but accidents do happen. But, there are bad ones or maybe bad people, like the crew in charge of BP when its Horizon well blew out in 2010. I’m suspecting some of the same “types of people” are involved at Intercontinental Terminals. The only way to get the attention of “these types” is to throw them personally in jail. It is these firms and people that should be subjected to the wrath of regulators, not EVERY firm. Well put and very reasonable. I work in risk management, people somehow believe everything is preventable and its simply not. If there is negligence we have a court system to handle that, going to the balme the greedy corporations card is old, worn out and takes very little thought. Well, Chuck, and Chris, I got news for you. The EPA didn’t do enough. This WAS preventable. Well Paula, I read the article. The headline is an opinion of the writer Cory McCord – Digital News Editor. What evidence does he have that this was “preventable?” Yes, ITC was fined in the past. But saying this was “preventable” is entirely conjecture at this point. A great example of lousy journalism. While I did use the term “accident,” I also stated that if this is due to “bad people,” they should go to jail. The vast majority of firms and people in the refining and petrochemical industries are committed to leaving a minimal “footprint” on the environment. It is quite typical for them to EXCEED regulations issued by EPA, OSHA, state and local agencies. The firms along the Ship Channel deal with highly flammable materials on a 24/7 basis, involving millions of barrels of materials every day. Would Mr. McCord or you kindly tell us when the last fire of this magnitude occurred? 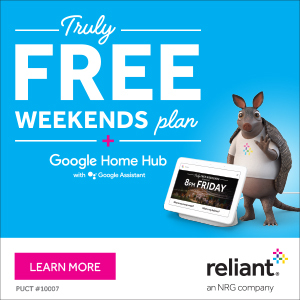 My husband works for a company based in Texas. You may have heard of AT&T. He’s on call 24/7/365 and monitors air pressurized equipment through various alarm sensors in the system. He has an allocated company ipad in which he can constantly monitor all of the equipment and flow, etc. Furthermore, an automated system calls him and the company issues a work assignment for the appropriate area. If necessary, he can, and frequently does, contact a work coordinator. Sometimes he’s even contacted directly from a work coordinator. He can be called out at anytime, any day, when the system detects a failure. I see nothing in the article or in the comments that suggest the same degree of system monitoring was done, or even practiced, in a company (industry wide) that distributes toxic, flammable substances. Where was the sensor? The alarm? The skilled technician? The call coordinator?